Naomi Watts, Adrian Brody and Jack Black stars in this spectacular film filled with heart-pounding action, terrifying creatures and groundbreaking special effects unlike anything you’ve seen before! 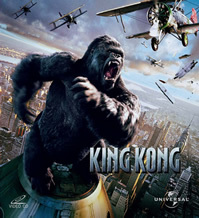 Get ready for breathtaking action in this thrilling epic adventure about a legendary gorilla captured on a treacherous island and brought to civilization, where he faces the ultimate fight for survival. Peter Jackson nailed Kong! (Please pardon bad pun) In his version based on the 1933 classic, Jackson delivered as promised, sticking close to the source material, yet adding his touches of epic grandeur. Doubling the original's length, clocking in at 3 hours, provided ample opportunity for character development for the major leads (and even for Kong itself), and doesn't scrimp on elaborate action sequences. Kudos to the cast for their effort in what is mostly interaction within imaginary backgrounds and a digital Kong. The main leads of Naomi Watts as vaudeville actress Ann Darrow, Jack Black as movie director Carl Denham and Adrien Brody as screenwriter Jack Driscoll were almost perfect. Given loads of time to flesh out their characters, you'd come to appreciate and understand their motivations a lot more. Black, known more for his zany comedies, makes a wonderful Carl Denham, adding slight humour to his dramatic role. Watts, as usual, looked beautiful in her role as the damsel, who, in an update, brings a certain tough attitude to her fragile exterior. Brody completes the trinity as the lovelorn Jack Driscoll who has to battle Kong for the affections of Darrow. Production values were certainly top notch, and in the instant this movie opens, you'll fall in love with the accurate depiction of 30s Manhanttan. For those who already know of the story outline, we begin in New York where Denham seeks out a new aspiring actress for his new movie set in Singapore (yes, we're mentioned, just like the 1976 remake). However, he's really leading the ship and crew to Skull Island to make his new movie, and there, they meet up with the island's unfriendly and hostile inhabitants, as well as its god, Kong. And Skull Island proved to be an action sequence playground, with the much touted Kong versus the Rexes (3 of them actually, probably my favourite would be the finale where Kong dealt the killing blows) being the highlight. In a parallel sequence consisting of Denham, Driscoll and various expendable crew, the dino-chase sequence probably put the Jurassic Park sequels to shame, although there are some portions where the digital rendering looked cheap. But minor nitpicking aside, it still made for some edge-of-your-seat moments. The hour on Skull Island provided much time for the Beast to fall for the Beauty, keeping her as its trophy companion, who performed vaudeville acts for its entertainment, while it served as her protector from mutant like creatures. Andy Serkis provided much of the facial movements and expressions for Kong, just like he did for Gollum in the Lord of the Rings trilogy. And we do see the sensitive side of the much maligned ape - it seemed that all it wants is a little tranquility, watching beautiful sunsets / sunrises with its human playmate, who seemed to be able to take the roller coaster tossings from limb to limb and from vine to vine with nary a scratch to her beautiful legs and indestructible lingerie. Perhaps a departure from the other Kongs is that this digital one kept its primal instincts in check, and doesn't attempt to disrobe our heroine. Noble. But as Fate would have it, Kong gets captured in an intense sequence, which shows off its brutality. The movie makes no apologies for many bites, kicks, and slams between human and beast, or amongst beasts. It's violent, but that's the way it probably is. And in Manhatten, hailed as the Eighth Wonder of the World, Kong wrecks havoc to look for Darrow, and brings her atop the Empire State Building for the climatic showdown. In between, I thought the ice rink moment was a pretty nifty touch, but one which somehow jarred the pace until the intervention of the army. And that iconic final scene, what a beauty! You'd know it's a lost cause, but yet it's a tragic spectacle to witness. To the sentimental ones, no, I know we'd have all fallen in love with Jackson's Kong by then, but we're sticking to the original, so don't expect anything else but the original ending. And speaking of which, I sure would have loved to hear Howard Shore's rendition of the soundtrack, but alas, his hasty departure due to creative differences with Jackson paved the way for James Newton Howard to pen the score. Not that it's bad, but I thought it lacked a certain oomph at times. In short, this Kong has all the ingredients of a mighty fine event movie. Given its length, it doesn't squander its opportunities for a more in depth take at one of the best known cinematic monsters created. Definite must-watch!